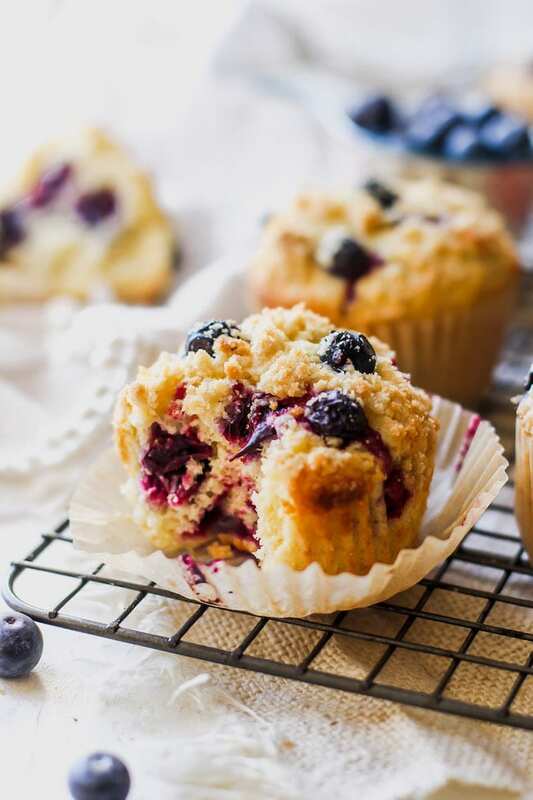 Easy homemade Blueberry Muffins that are light, tender, packed with juicy blueberries and finished with a sweet streusel topping. This is the BEST Blueberry Muffin Recipe! Blueberry muffins have always been my favorite. When I was little, I used to bake blueberry muffins from a box and thought they were amazing, even though the blueberries came out of a little can. I promise, my taste buds and kitchen skills have evolved after years of practice, and I can say with confidence that I now make the BEST Blueberry Muffins. I have made a lot of recipes over the years, from boxes and from scratch, and these are hands down the best! 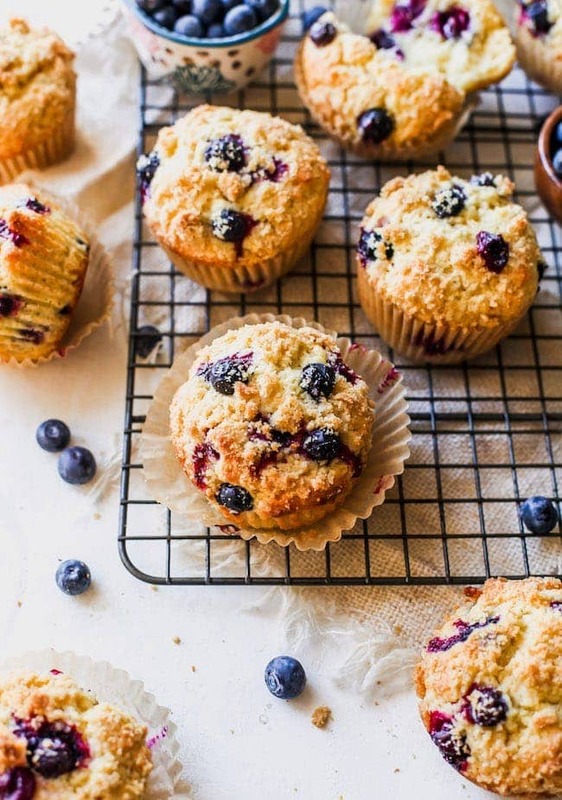 My blueberry muffins are fluffy, tender, buttery, full of juicy blueberries, and have a sweet streusel topping that makes them the best blueberry muffins you will ever eat. They will remind you of a bakery blueberry muffin, but BETTER! And bonus, they are SO easy to make at home! 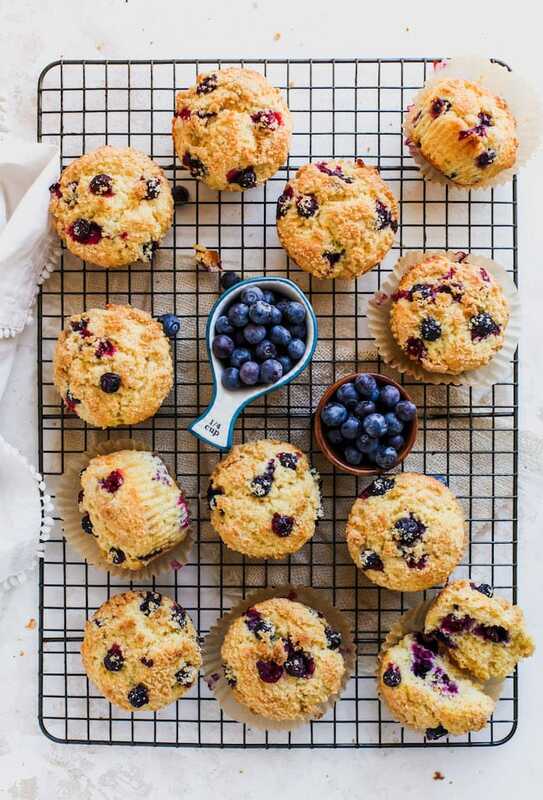 Can You Use Frozen Blueberries to Make Blueberry Muffins? First of all, let’s talk about the star of the muffins, the blueberries! I love using fresh blueberries when they are in season and affordable. When it isn’t blueberry season, I opt for frozen blueberries because they are cheaper and you can always count on the quality because the blueberries are frozen when they are ripe and in season. 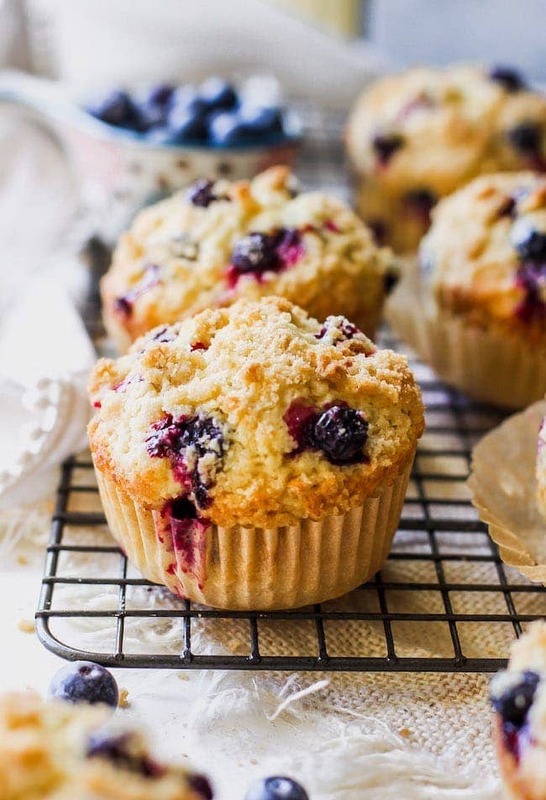 So both fresh and frozen blueberries can be used to make blueberry muffins, which means you can make blueberry muffins all year long! No excuses! You don’t need to thaw frozen blueberries before using them, but here is a little tip if you don’t want the frozen blueberries to change the color of your muffins. 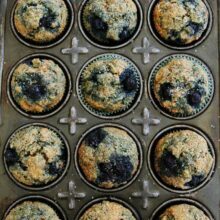 Unlike fresh blueberries, frozen blueberries bleed into the batter and can turn the muffins a greenish blue color. If you want to prevent the color change, you can rinse the berries under cold water until the water is noticeably lighter when you drain them. Place the blueberries on a few layers of paper towels, top and bottom, and let dry. Gently fold the blueberries into the batter and don’t over mix. This step isn’t necessary, the muffins will still taste good without rinsing frozen blueberries, but if you are worried about the color changing, rinsing will help! Have you had a blueberry muffin where all of the blueberries are at the bottom? Not fun, right? You want a muffin that has juicy blueberries throughout the entire muffin. 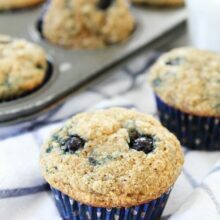 To prevent blueberries from sinking to the bottom of the muffins, you can coat the blueberries in a little flour before stirring them into the muffin batter. 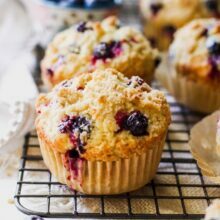 Homemade blueberry muffins are easy to make and with these tips you will make perfect blueberry muffins every single time! Preheat the oven to 400 degrees F. It is important to bake the muffins at a higher heat so they will rise properly. Make the streusel topping and put it in the refrigerator until you are ready to use it. You don’t want the butter to get warm. And don’t skip the streusel topping, it takes the muffins to the next level. Make sure your baking powder is fresh. Yes, it does expire so check the date! Whisk together the dry ingredients in a large bowl, making sure there are no brown sugar clumps. Whisk together the wet ingredients in a small bowl. Make sure the butter is melted and slightly cooled and the eggs and buttermilk are at room temperature. Pour the liquid ingredients over the dry ingredients and gently stir together with a spatula. Don’t over mix the batter, stir just until flour disappears. In a small bowl, combine 1 cup of the blueberries with 1 tablespoon of flour and toss until blueberries are coated. Gently fold in 1 cup of the blueberries, being careful not to over mix. Divide the muffin batter evenly among the muffin cups. I like to use an ice cream scoop. Top each muffin with remaining 1/4 cup blueberries, pressing them gently into the tops. Remove the streusel from the refrigerator and sprinkle evenly over each muffin. Gently press the crumbs into the batter. Bake for 18 to 20 minutes or until the muffins are golden brown and a toothpick inserted into the center of a muffin comes out clean. Let the muffins cool for 5 minutes before serving. Please enjoy a blueberry muffin right out of the oven and if you want to slather butter all over it, be my guest. But after the muffins have cooled completely, you can store them for on the counter for up to 4 days. To prevent muffins from getting soggy and too moist on the top, I like to store them under a glass dome so they are covered but there isn’t too much moisture. You can also store them in an airtight container that is lined with paper towels. The paper towels will help absorb some of the moisture so the muffins don’t get too soggy. I don’t recommend storing them in the refrigerator. You can freeze blueberry muffins. Place the cooled muffins in a freezer bag and freeze for up to 2 months. Let thaw at room temperature or reheat in the microwave. I always try to keep muffins in the freezer for breakfasts on the go or when we want a muffin snack! Preheat oven to 400 degrees F. Line a muffin pan with paper muffin cups or spray with nonstick cooking spray. Set aside. To make the streusel: Combine the flour, brown sugar, and butter pieces in a small bowl. Mix in the butter with your fingers or a pastry cutter until you have a crumb mixture. Place the streusel in the refrigerator until ready to use. To make the muffins: In a large bowl, whisk together the flour, sugar, baking powder, and salt. Add the brown sugar and whisk again until there are no brown sugar clumps. In a small bowl, combine the melted butter, eggs, buttermilk, and vanilla. Whisk until eggs are well combined with the other liquid ingredients. Pour the liquid ingredients over the dry ingredients and gently stir together with a spatula. Don't over mix the batter, stir just until flour disappears. In a small bowl, combine 1 cup of the blueberries with 1 tablespoon of flour and toss until blueberries are coated. Gently fold in 1 cup of the blueberries, being careful not to over mix. Divide the muffin batter evenly among the muffin cups. Top each muffin with remaining 1/4 cup blueberries, pressing them gently into the tops. Remove the streusel from the refrigerator and sprinkle evenly over each muffin. Gently press the crumbs into the batter. Bake the muffins for 18 to 20 minutes or until the muffin tops are golden and the tops are set. You can insert a toothpick into the center of a muffin and if it comes out clean, they are done. Transfer the pan to a cooling rack and let the muffins cool for 5 minutes in the pan. Remove from the pan and enjoy! What would be the bake time if I did 6 jumbo muffins? I currently only have that size tin. Thanks. Dying over this streusel topping! I haven’t tried using powdered buttermilk. Let me know if it works! Can I add lemon zest and juice to this recipe? 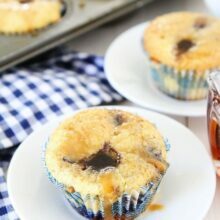 Oh, my very most favorite muffins ever! What a great recipe. Far and away the best blueberry muffins I’e ever made. So easy, fast and delicious. 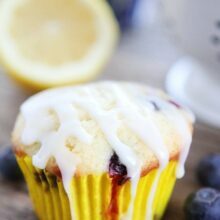 So happy you loved our blueberry muffin recipe!